Andy Kilmartin. Pic by Pacemaker. Glenavon have confirmed exits for David Elebert and Andy Kilmartin - with both players opting to turn down one-year offers to stay at Mourneview Park. 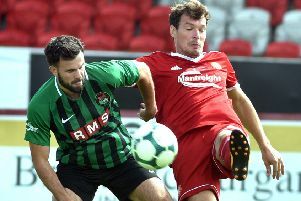 The Lurgan Blues missed out on European football and a financial £200,000 jackpot with defeat to Ballymena United in the recent Europa League play-off final. David Elebert. Pic by PressEye Ltd. Manager Gary Hamilton is set for a summer of tough talks as he attempts to retain exisiting players and recruit fresh targets within a restricted budget. However, Hamilton and the club proved keen to keep both Elebert and Kilmartin on board. Glenavon’s official website has reported Kilmartin’s choice to move on as due to the 34-year-old midfielder having agreed a “two-year deal with improved terms at another club”. The club website has also confirmed the offer of an “appearance-related” contract to 32-year-old Elebert, with the centre-back declining the terms. “I wish to thank Andy and Dave for their services to the club,” said Hamilton, who adopts a policy of limiting contracts to players over 32 years old to one-year deals. “In my opinion they were two of the best pros I have ever worked with, both in my playing and management days. “I’m gutted to lose the two of them but understand and respect their reasons and wish them all the best in the future.